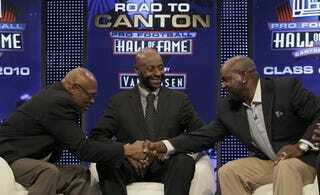 Jerry Rice and Emmitt Smith (and others) get their yellow jackets tonight. Travesty. What'd either of them ever accomplish? Floyd Little gets his, also. Finally. Little has stopped fretting over the notion that being the only great player on a very bad team was being held against him, even though he produced numbers comparable to other great players who entered the Hall of Fame with much stronger supporting casts. He is focused on the possibility that other forces could have been at work all these years. Thank you for your continued support of Deadspin. And thank you for everything that you do. Unless everything that you do involves juggling cats. If that's the case, I thank you for everything that you do except juggling cats. That's just sick.